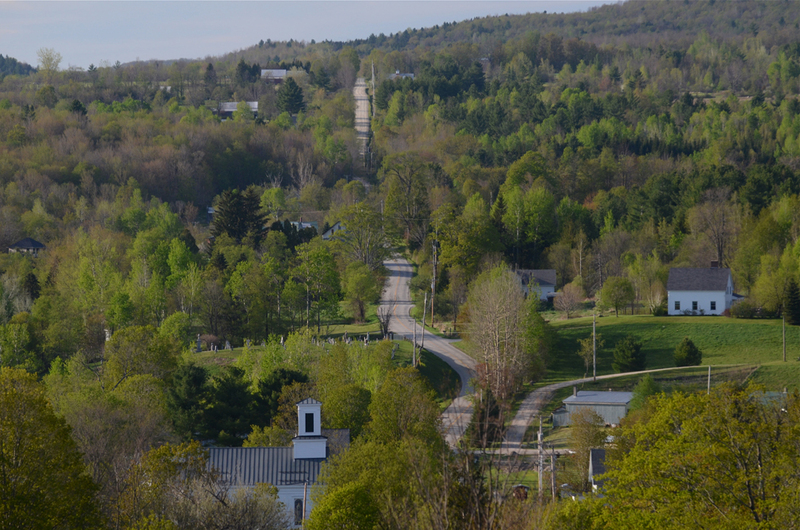 Lincoln is one of the most beautiful mountain towns in Addison County. It sits up above the town of Bristol in the lap of the Green Mountains, and the mountain peaks that rise above the village include Mt Abe, Glen Ellen, and Roosevelt. The Long Trail runs across these mountaintops and provides a spectacular view of Lincoln's patchwork of farm fields, and densely wooded areas. The New Haven River flows from these mountains, where you'll also find a town library, town offices, town hall, and the local elementary school. Lincoln town center is quintessential Vermont, with its white-steepled church, fire department, and charming general store. Many of the roads are still dirt and it feels like "real country," yet you are just 40 minutes to Burlington, 30 minutes to Middlebury, and a quick drive down to the town of Bristol, where you'll find many necessary amenities. Search all listings for sale in Lincoln, VT below. If you have any questions or would like more information on a property - contact us. You can also sign up for a free account to save your top listings and get updates when similar listings come on the market. Great opportunity to build your dream home in the mountains of Lincoln! Nestled in a pine grove, the land rises up to a level house site, with mountain views waiting for you with minimal clearing. Set well off the road, this private location offers the best of both worlds- privacy and views! This 5.1 acre lot comes with a a proposed house site and a State WW permit for a 4 bedroom home. Come take a look and imagine your new home! Custom, Country Ranch with handicap accessibility throughout! Located in Lincoln with majestic views of Mount Abraham, this house invites you to enjoy all of its creature comforts! Sit awhile on the attached porch enjoying the views or entertain on the attached screened porch overlooking the garden. Beautiful fieldstone gas fireplace graces & warms the family room and can be enjoyed from all other main living areas including the living room, dining area & kitchen. Lots of closet space w/attached 2+ car garage which houses a chicken coop allowing you the convenience of collecting your fresh eggs every day without stepping outside! Wonderful well maintained and renovated 1880 3 bedroom Vintage Farm House with lots of natural light on 12.43 +/- acres sitting above the New Haven River in Lincoln. Nice over size one car garage with extra carport on .28 acres across the road from home with separate well and great garden area. Amazing Mountain views including view of the Green Mountain Presidential Range. Move right into this home with large rooms and a 24 x 10 foot heated sun room which offers added living space with lots of windows for great light year round. All windows have been replaced for energy efficiency. 7000 watt generator with automatic transfer switch to protect against power outages. Solar hot water system. SAVE MONEY!!! Newer furnace and solar hot water tank. Bedroom and full bath on main floor for easy accessibility. Bright and clean home with large rooms waiting for a new family. Many upgrades to this home so check it out today. A contemporary mountain home with amazing views! Live all on one level, with additional living space on the lower walkout level as well. Walk into the great room with cathedral ceiling, and glass doors walking out to the deck. The majestic mountain views beyond the pond will take your breath away! The floor to ceiling stone fireplace is a focal point, and adds a handsome feature to the room, as well as the custom water feature. The spacious kitchen features birch cabinetry, a built in wet bar, and a center island with a granite top. A large master bedroom and bath overlook the views as well, and the master also walks out to the deck for morning coffee! Large walk-in closet/dressing room completes that picture. A second main level bedroom also makes a great office! The finished lower level has a large family room with a second fireplace, an additional bedroom and bath, and extra room great for billiards, exercise room or playroom. The family room was rough plumbed for a kitchenette if a new owner wanted to make an inlaw suite on this level. A heated, three car garage houses your vehicles, tractor or has space for a workshop. Ready to move in, makes this house your home! Nestled in the Green Mountains, this sophisticated hideaway is privately sited. The 59 acres is a beautiful blend of open land for pasturing animals and wooded land supplying you with firewood, nature trails and privacy. Atop the knoll in the woods overlooking the majestic swimming pond, is a cozy and rustic retreat cabin with gas lights and a wood stove to warm you on those crisp cold nights. The main house is a custom built Post & Beam featuring 3 levels, 2 currently finished with attention to every possible detail and comfort. The main level overlooks the estate and pond and has an open great room with bridge overlook on the 3rd floor. The kitchen opens to the great room and has everything a cook could ask for: soapstone counters, pantry and fully equipped with appliances to enjoy cooking and meal prep. The master suite is on the main level and has a steam shower and all the comforts of home. The main level also has a guest room, bath, cedar closet and laundry. On the 3rd floor is the entertainment/office and 3rd bedroom and bath. The lower level is unfinished and heated, great for storing your vehicles, toys and equipment. A wonderful property for animals and outside enjoyment! Trails, pond, open and wooded land - limitless possibilities! All for your enjoyment. Beat the heat in this mountain retreat on 20+ acre parcel of wooded heaven in Lincoln. Mostly surrounded by National Forest, this property has all you need to escape from the worries of the world. Off the grid with a year round stream and seasonal mountain views, with year round potential. Open great room with kitchen, living room and loft, one bedroom and bath, large workshop with additional bath and woodstove to keep you cozy on cold nights. Perfect for a retreat or hunting camp. Nestled in the hills of Lincoln Vermont this lovely 3-bedroom 2 bath home offers you peace of mind from the burden of energy bills, with a Geothermal heating and cooling system that is rated for 4000sq ft, and owned solar panels that provide Electricity for the main house. The current owners have also made the home more energy efficient, adding 3+ ft of insulation as well as installing high performance windows and storm doors. Enjoy an open floor plan on main level and a fully finished basement with a third bedroom with walk in closet and a game room space. Many tasteful features have also been added to the home including built-ins and hardwood floors from Maple and Cherry harvested and milled on site. The Home also features a 34kw commercial generator with auto transfer to ensure you never lose power. There is a fully wired barn perfect for an RV or wood shop. Have your own business in the 3-bay well insulated garage. Watch the seasons change from the base of Mt. Abe from the large back deck and 21' above ground heated pool. Enjoy the privacy of mountain living on 3.9 acres of wooded and manicured acreage with numerous mature flower gardens on the property. With the convenience of being only five minutes to Lincoln and 15 to Bristol. A unique home for those who are conscious of the environment! This spacious country home enjoys views from every room and a nice combination of both open and separate living spaces. The large cherry kitchen is open to a breakfast nook and family room with a woodstove. Off the kitchen to the west, the separate dining room flows into the spacious living room which enjoys both southern and western exposure, vaulted ceilings, a cozy south facing window seat that fills sunshine and an expansive Mt. Abe view, and a large stone fireplace for wintry Lincoln nights. The first floor also includes a mudroom connecting the attached 2 car garage, and an office space as well as a half bath. The second floor of the home includes a master bedroom with private bath and soaking tub, a full guest bath down the hall, a laundry room and 3 additional bedrooms. A walkout finished basement provides for additional living space with a large bonus room, another full bath and an additional bedroom for overflow guests. Situated on a nice 4.8 acre lot bordering Beaver Brook in the back and panoramic mountain views from the front porch and yard. Close to skiing at both Madriver Glen and Sugarbush. Enjoy the ease of single level living in this peaceful and tranquil Lincoln location! Plenty of space inside the house for bedrooms, office space, workshop space. Outside you'll find a private lot with rooms for gardens, walking paths, stone walls and play! This house is ready for a new owner and the current owner will provide $1000 at closing for painting supplies - pick your own colors. The basement is dry, thanks to french drains and there's plenty of room in that walk out space for a workshop, exercise room, play room, office space - you name it!! This house is in good condition and the owner is VERY motivated!! Panoramic Green Mountain views and privacy make this building lot stand out amongst the rest! Offering two potential building areas, both open up to an expansive view of Mt Abe and the Presidential Range. Take a moment and sit near the carefully stacked boulders which perfectly align with the apex of Mt Abe to embrace the special energy that many feel in this area. Listen to the trickling water of the nearby brook and catch glimpses of the abundant wildlife. This lot is easy to develop with driveway already in place, power on site, and a conventional 4BR wastewater permit in hand. Bring your building plans and soon this special location can be the site of your new home. Possibility of purchasing adjoining 2 acres (Lot 1) with finished home. Designed by award winning Architect John Anderson, this equestrian property features a 4 bedroom contemporary home sited on 50 acres in one of the most breathtaking areas of Addison County. So many custom features to impress from the kitchen with solid cherry cabinets and 2 inch thick marble counters to the solid cherry flooring throughout the house. Soaring windows greet you on both levels. Walls are constructed of 1 inch thick plaster for both passive solar warmth and sound protection. Curl up with a good book by the soapstone woodstove in the gallery room highlighting a 30 foot stacked window wall. Or enjoy the evening in front of a roaring fire in the living room's two story fireplace with stones gathered on the property. At the end of the day, the second floor master will make you feel like royalty with its soaring wall of windows facing south to Bread Loaf Mountain and eye brow window over the built in sail boat bed facing Mount Abraham. There are 3 additional minimalist bedrooms on the second floor with a custom cherry office area and library. The horse barn contains six stalls and a huge tack room with plenty of space for meetings or relaxing. There is a 3 car garage and attached studio and a log cabin on the Cota Brook. Automatic generator. Owner is a licensed real estate agent. Occasional high winds. Great investment opportunity located in the beautiful Lincoln Valley. Live in one unit and have renters help pay mortgage or rent out all three units for additional income.This 3 unit multifamily home sits on a one acre lot with 234 feet of frontage on Beaver Brook and with the needed upgrades and improvements this house has so many options. Currently, there is a 4 bedroom rental unit on the first and second floors of the original farmhouse, and a downstairs 2 bedroom and an upstairs 2 bedroom unit in the large addition built in the 1990s. It can be owner occupied with two rental units, reconfigured as a large family home with an upstairs accessory apartment, or complete the needed renovations and rent all 3 units. Situated just 20 minutes to Sugarbush, 15 mins to Bristol, and 45 mins to Burlington this is a great investment opportunity. Amey offers an upbeat attitude and great communication skills along with professionalism and speed. Nothing to improve upon!